This review first appeared in the November 7, 1984 issue of The Daily Aztec. 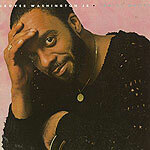 Grover Washington Jr.'s reputation as a leading light of smooth jazz was cemented by his 1980 chart-smashing duet with Bill Withers, "Just the Two of Us." But the saxophonist was already known for his R&B-based easy listening instrumental style; his bright tone and soul sensibility have marked him as one of the top players in instrumental music. All of this combines to make his latest venture, "Inside Moves," a disappointment. Washington displays little of the personal flair that has marked most of his work. His solos are too restrained, and he never really explores any of the songs. here. The title cut opens the album rather inauspiciously. Washington's solos are full of broken chords and scale runs; nothing really special. "Dawn Song" is even more simplistic, and is typical of Washington's flat performance throughout the rest of the album. The best track here is "Watching You Watching Me," featuring Jon Lucien on vocals. His deep voice is a nice partner for Washington's sax. Lucien exhibits more vocal range on "When I Look at You," and shows a voice just as warm and smooth as Washington's saxophone. "Sassy Stew" closes out the album fairly strongly, and is reminiscent of Washington's previous work. Why a track this good was saved for the end is mystifying, especially given the weakness of much of the rest.